Our experienced design team, dedicated craftspeople, and build-to-order production facility make Manning Lighting a great fit for custom fixture orders or modifications to standard products. 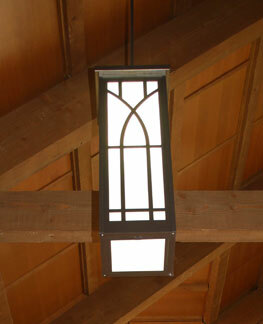 Trust Manning Lighting with your next custom lighting project. 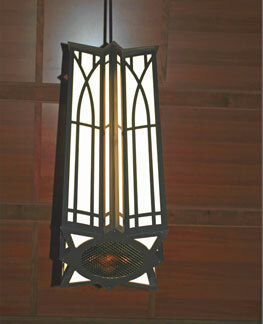 We have 70 years of experience designing and building custom lighting equipment. Our Custom Engineering Team meets daily to review requests and then develops a submittal drawing and quotation based on your inquiry. We can frequently incorporate tooled components, light engines, and other elements from our standard product line into custom products to minimize cost, even for quantities as low as one piece. We’ll work with you to develop your concept and provide additional drawings, 3D renderings, sample parts or even a sample fixture to ensure you’re comfortable with the direction chosen. Click on the photos above for examples, or see our Project Gallery for more of our custom portfolio. Just contact your Manning Rep or us at the factory to get your project started. Pennsylvania’s Bryn Athyn College specified both a modified standard product and a totally custom pendant for their new Brickman Center for Student Life and Admissions Building. The standard Greene series pendant (left) was modified with a custom panel design while the larger pendant (right) was designed specifically for the building. Do you love almost everything about one of our standard products but wish you could change just a couple things? Our standard product line was designed with modification in mind. Many of our fixtures incorporate decorative panels that are easily made with your design instead of our standard options. All we need are your CAD files (dxf or dwg) or even a sketch that we can apply. Panels from the Greene, Prairie, G2, and other product families can also be easily modified at nominal cost. See illustrations below for examples of size guidelines. Need something larger or smaller than shown? Many fixtures utilize extruded components. These tooled foundations have inherent flexibility allowing for economic length variations as required. Just specify the custom height you need, and we’ll do the rest!